Since the inaugural Women Angel Investor event on Nov. 1, 2017, the Northern New England Women’s Investor Network (NNEWIN) has been busy planning, hosting and networking among the group and beyond! Women Angel Investors from Maine, New Hampshire and Vermont are working hard to increase the awareness and education of other accredited women investors. These efforts have led to many conference calls, meetings and events, as well as shared resources and a collaborative environment for women to learn from each other and experienced Angel Investors such as Jean Hammond. We are tremendously fortunate to have such a leader in the angel community dedicating her time and expertise to support the NNEWIN. Jean is a co-founder and partner at LearnLaunch. She’s a serial entrepreneur and an active investor in Hub Angels and Launchpad Venture Group, and she is the founder of the Boston Forum of Golden Seeds. She has an active portfolio and has served as a director or advisor with over 30 of the companies within her portfolio. Jean is excited about the opportunity to build a strong group of new women angel investors that can share deal flow in the future within the tristate region. The Northern New England Women’s Investor Network (NNEWIN) started the year strong with a tristate live webinar on Feb. 6 titled “Deal Terms in Angel Investing”. Jean Hammond moderated a panel with Jess McClear and Christopher Mirabile. Over 30 women participated in the live webinar from 4 locations – Portland, ME; Portsmouth and Manchester, NH; and Montpelier, VT. On March 22, New Hampshire hosted a live workshop titled, “Due Diligence Demystified”. Twenty five women from the three states came together for a lively discussion and a great networking reception. Both events were recorded and now available on the NNEWIN page of the Live Free and Start website as a free resource for women interested in learning more about angel investing. On the heels of that event was the first pitch day for the women focused Impact New Hampshire Fund on March 23. Eight women lead companies pitched to the Investment Committee of the fund. The quality of companies pitching was excellent and the investment committee is now in the due diligence process for some of the companies. 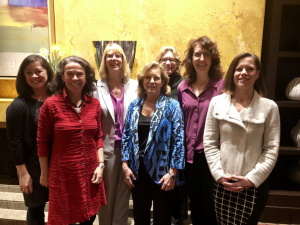 Ten women from the NNEWIN group went to events at the Angel Capital Association Annual Conference in Boston April 17-20. From Angel 101 training, to Impact Mapping, International Investing and a Women’s Angel Fund Portfolia Summit just to name a few of the events before the conference even started! Next on the calendar is another webinar on May 24 from 5:00-6:30 pm. It will be broadcast live to four locations in NH, ME and VT. Jean Hammond will moderate a panel of experts to discuss what to expect “After Your Angel Investment”. The presentation will cover board governance, monitoring your investment and supporting the entrepreneurs. The webinar will run from 5-6 pm with time for Q&A followed by networking. On June 21, Maine will be hosting an all-day tristate event for women angel investors in Portland. This immersive, simulation “pitch to investment” hands on learning experience will include company pitches with an award/prize presented to the company the participants select based on their pitches and supporting materials. The NNEWIN will hold another live tristate event in Vermont in the Fall 2018. More details on that event will be posted to the NNEWIN landing page on the Live Free and Start website. The women in the NNEWIN are forming strong connections that will help women entrepreneurs have more access to potential funding. The goal of bringing more women to the table for angel investing is becoming a reality thanks to the NNEWIN group. If you would like more information on the upcoming events please email Liz Gray at connect@livefreeandstart.com.